The New Space Opera 2: All-New Tales of Science Fiction Adventure is, as its name implies, the second of Gardner Dozois and Jonathan Strahan’s themed anthologies attempting to put a modern spin on space opera, a subgenre of science fiction which causes many of us to think of big metal spaceships crewed by handsome blaster-wielding men who protect us from evil aliens that want to destroy the Earth, or at least steal it’s shrieking scantily clad women. We laugh at these old stories now — the way they ignore the vacuum of space and the effects of relativity, the way their aliens seem a lot less alien than they should, and the way that they rarely seem to display the variety in species, climate, fauna, language and culture that should exist on inhabited distant planets. 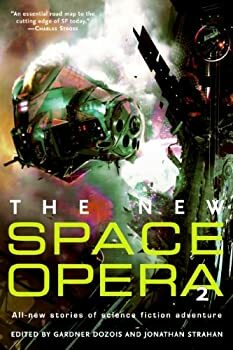 A few years ago, to address this problem, Dozois and Strahan invited some of our favorite science fiction authors to prove to us that space opera deserves to be brought out of the back of the closet, dusted off, shined up, and nudged out the front door. Thus, The New Space Opera: All-New Tales of Science Fiction Adventure was published in 2007. The New Space Opera 2, as you’ve probably guessed by now, is the second such volume. Originally published in 2009, it earned the Locus Award for Best Anthology of the year. “Utriusque Cosmi” by Robert Charles Wilson — Carlotta, daughter of a meth-addicted mother with an abusive boyfriend, gets a chance at a new life when she’s “raptured” by a hive-minded entity and turned into data. Millions of years later, she goes back in time to revisit her bodily self on the night before the rapture. Wilson’s story is notable because it’s both vast and tiny in scale. It spans the universe over millennia, yet deals with one girl’s personal struggle. Brilliant narration by Bahni Turpin. “The Island” by Peter Watts — A spaceship crew has been building hypergates for millions of years for a civilization they no longer feel they belong to when they run into an alien life form that they have no idea how to deal with. This story has some fascinating ideas and feels especially modern because it addresses some of those space opera clichés I mentioned above. “Events Preceding the Helvetican Renaissance” by John Kessel — To try to free his planet from the tyranny of an empire, a young monk steals the empire’s sacred texts. This story is exciting all the way through and deals with some age-old religious questions. This was one of my favorites. “To Go Boldly” by Cory Doctorow — As you can tell from its title, this funny short story is a Star Trek parody. In his usual style, which often comes across as sarcastic and sneering, Doctorow points out the logical problem with the Star Trek transporters. “The Lost Princess Man” by John Barnes — This fun twisty novelette is about a man who scams insurance companies by kidnapping orphaned girls and telling them they’re lost princesses. When he meets an aristocrat in a bar, the jig is up. The narration by Tom Taylorson is wonderful and this was another favorite. I’m going to have to seek out more by John Barnes. “Defect” by Kristine Kathryn Rusch — An intelligence agent who purposely botched her last mission is on the run when she finds out that her son, who she hardly knows, has been injured. As she deals with her new role as a mother, she must also keep herself and her son safe from those who are trying to kill her. “To Raise a Mutiny Betwixt Yourselves” by Jay Lake — A female space captain deals with mutiny and betrayal aboard a sentient starship. I didn’t care for this one. Shell Game” by Neal Asher — I couldn’t get into this story about one man’s plans to foil snail-like alien invaders. It did, however, make me want to explore Neal Asher’s Polity universe. “Punctuality” by Garth Nix — A young newly chosen empress integrates with her ancestors… I think? Very short, very strange, but I love listening to Xe Sands read anything, so it doesn’t really matter if I didn’t understand it. “Inevitable” by Sean Williams — A captured terrorist who wants to avenge his brother’s death must team up with his captor to survive a bizarre time paradox. Both learn something by being exposed to the other’s ideas. This story has some memorable imagery and world-building. “Join The Navy and See the Worlds” by Bruce Sterling — This story about a future Earth where the geopolitics have greatly changed after nuclear war is a bit dull and inaccessible. Sterling can be like that. “Fearless Space Pirates of the Outer Rings” by Bill Willingham — After a mutiny, a space pirate needs a new career. This story has a great twist at the end. Willingham gives the narrator a challenge, but R.C. Bray pulls it off brilliantly. “From the Heart” by John Meaney — Carl Blackstone lives two different lives. In one of them he’s a spaceship pilot who failed to earn his wings and, as a consequence, lost his girlfriend and endures public shame. But he has a private life, too — an impressive one he can’t share with the world. I had a hard time believing some of the plot of this story, but it did make me think a bit. “Chameleons” by Elizabeth Moon — A bodyguard is transporting the two sons of a wealthy man home from school. When they are stranded in a space station for three days, he worries that it might be a trap. This story is fast-moving and exciting once it gets going, and it’s easy to root for the main characters. Moon’s story feels like a Heinlein Juvenile, which is a good thing. “The Tenth Muse” by Tad Williams — Tad Williams gets literal with the space opera theme and tells the story of a spaceship cabin boy who helps his crew deal with an aggressive alien ship that’s blocking the wormhole they need to enter to get home. This climax of this story requires a huge suspension of disbelief, but it’s really entertaining. “Cracklegrackle” by Justina Robson — I was mostly bored by this story about a worried father who goes with a shamanic gargoyle to Mars to look for his missing daughter. There are some interesting ideas about perception, but mostly I didn’t get the point of this tale. “The Tale of the Wicked” by John Scalzi — Two spaceships are battling each other when suddenly they stop taking orders from their captains. Scalzi takes the old self-aware computer cliché and adds another law to Asimov’s three laws of robotics. This one’s a little obvious, but entertaining nonetheless. “Catastrophe Baker and a Canticle for Leibowitz” by Mike Resnick — Catastrophe Baker has no idea what a canticle is, but he’s been hired to find a missing one. To do so, he must partner with a beautiful but extraordinarily aggressive woman named Voluptua von Climax (snicker). This funny story didn’t have to be set in space. R.C. Bray gives another memorable audio performance. “The Far End of History” by John C. Wright —Wright’s post-human universe-spanning spin on the romance between Ulysses and Penelope was so strange and there were parts I loved and parts I had to skim. It’s got an interesting structure and a huge dose of cosmic mythology. So, overall, a mixed lot, which is exactly what I was expecting, since that’s usually what we get with themed anthologies. But, this diversity means there’s something for everyone here — you’re sure to find several stories you’ll love and the audio narration is excellent across the board. Dozois and Strahan succeed in updating a tired cliché-ridden subgenre of science fiction. The New Space Opera 2 still contains most of the elements we expect — aliens, robots, sentient computers, strange planets, time paradoxes — but it also features strong women in leadership roles and a more realistic handling of the mechanical problems of travel and battle in a relativistic space-time continuum. I don’t know if there will be a third volume of The New Space Opera, but if there is, could we please have some Bujold?